Are you ready to find out who won March's challenge? Feel free to grab our badge for your blog! "March Winner" in the subject line. You have until April 15th to claim your prize. Thanks to everyone who participated in our March challenges!! Stop by on April 1 when we reveal our first challenge for April! Here's what Wendy K said about her layout: "I wasn't sure about the letters on this layout at first. I left it and came back the next day. Funny thing is that I liked it right away. I dug deep in my stash for most everything on this layout." You have until midnight (PST) TOMORROW to get both of your March's challenge layouts linked up to Mr. Linky on the right side of our bog! There will be 1 random drawn prize winner, the top 3 layouts and 1 will be offered a GDT position!!! It's Hump Day!! Boy do I love Wednesdays!! 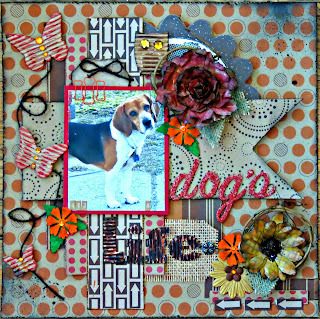 Today, Brenda shows us a great color combo layout she made for the sketch layout and did a great job at mixing the alphas! "Loved working with this sketch!!! What makes it even better is the fact that I was able to get some older photos scrapped of my granddaughter, using some of my old stash of MME Indie Chic collection. For the stash part of this challenge (mixed alphas), I used two different packs of my older Thickers! I even pulled out my Cricut, which I hardly ever use , and created my flower. Looking forward to seeing everyone's take on this sketch!!!" Today we are sharing a layout created by our DT Haley inspired by our March Sketch Challenge. "This sketch came at the perfect time because I decided to move most of my Christmas layouts into a Christmas album, and I created the title page following the sketch. (The photos are from 2001, our youngest's 1st Christmas, '03 or '04, and this past 2012.) The papers are last year's Close To My Heart Christmas collection, Pear & Partridge. Don't you love double-sided paper? The ornaments were cut with the CTMH/Cricut Art Philosophy cartridge. I cheated a bit in my title and used a Rusty Pickle stamp set from my stash. 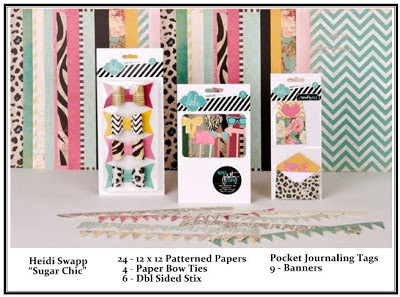 If you are like me and haven't indulged in all the cool washi tape, just use patterned paper instead." You still have a few days to get your entries in for a chance to enter into our monthly prize drawing! We would love to see what you do with this sketch and use mixed alphas! 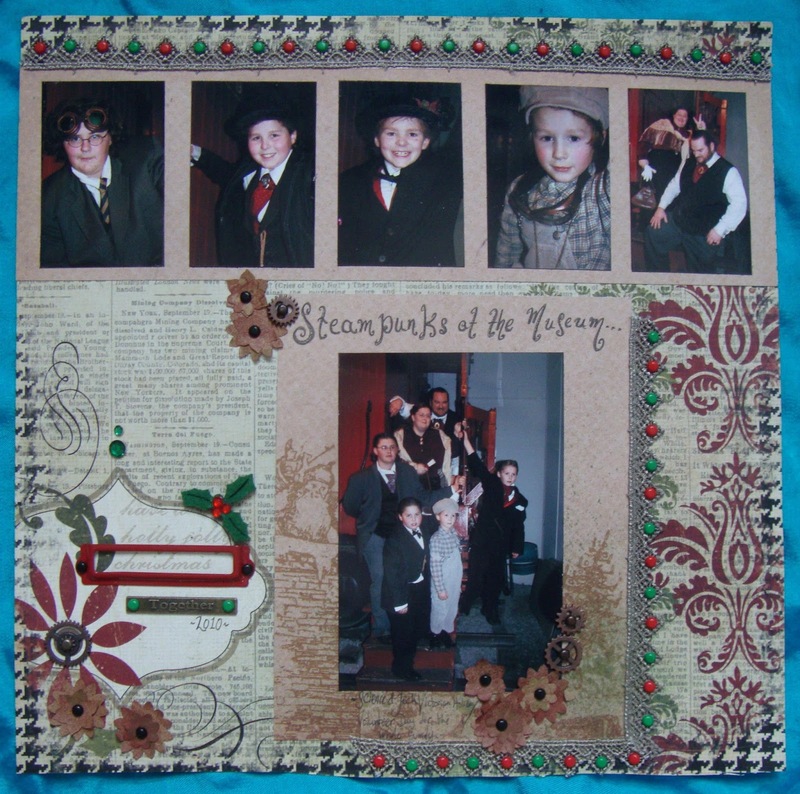 Look at the fabulous layout DT Wendy C. did from the sketch! Aren't those photos amazing?? 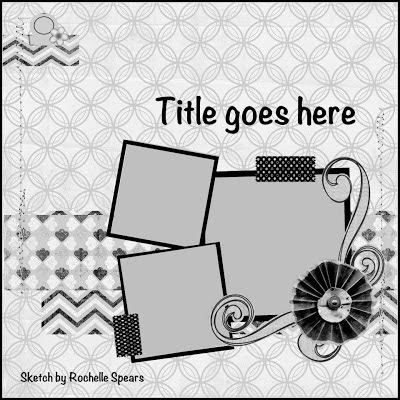 Here's what Wendy said about her layout: For my title, I used some letter stickers and some Thickers alphas. I used 2 different colors of glitter on my DIY Thickers. I wish I had made my own accordion flowers, but these are from K&Company. Don't forget... you have a few days left to get your layout uploaded!!! "I love the look and feel of this sketch. I used DCWV letterpress cardstock to highlight the final stretch of the Seattle to Portland ride my DH did in 2002. I used letters from pebbles, American crafts and Authentic. I love the bright colors that helped project these photos of the bridge. 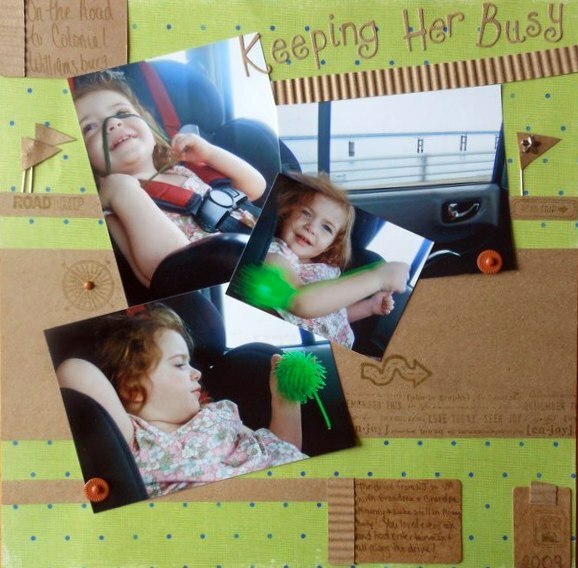 I added some misc buttons and a flower from Doodlebug." There is still time for you to submit your challenge. You will find the challenge and sketch information HERE!! 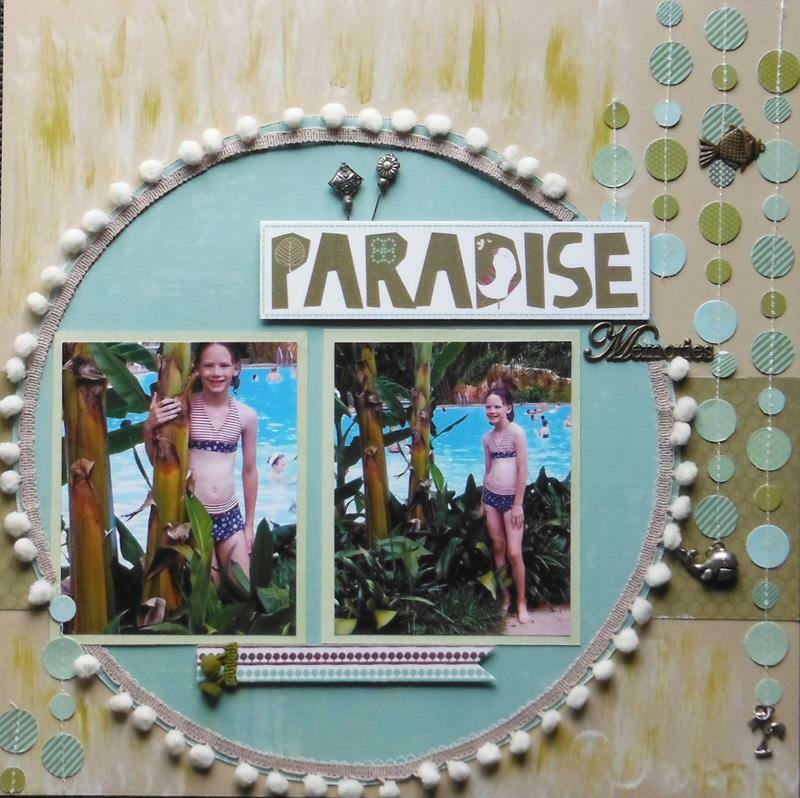 "I like the sketch, even if my pictures were of a different size I managed to fit them in all three and combined papers from Glitz and Pink Paislee to create this LO to remember a happy moment on holidays in Delft. Three different letter fonts are used." I just love - love stories! :) Today we are sharing DT Sarah's beautiful layout about her Love Story. "My layout is of our (now annual) trip to the place we had our year-and-a-day-before-the-wedding Celtic Betrothal Handfasting ceremony. On our Wedding Anniversary we go to the same stone we stood on for the swearing that day and we bring a stone from our garden to leave behind. September 25th 2012 was our 2nd Anniversary and we took these pictures on our visit that day. We are moving in less than 3 weeks (YEAH!) so almost everything is now packed including ALL my letter stickers so I used some Word Rub-Ons that were still hanging around and an acetate title overlay for my mixed alphas. 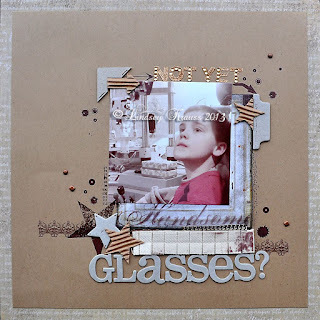 Papers are from the CTMH 'Key to my Heart' page set. Small Flower has some $1 store pearls in the center. Washi Tape, Ribbon, Gems, Acetate and Rub-Ons are unknown to me stash sh-tuff." Don't forget you have until March 29th to link up your layouts! Check out the current challenges HERE! 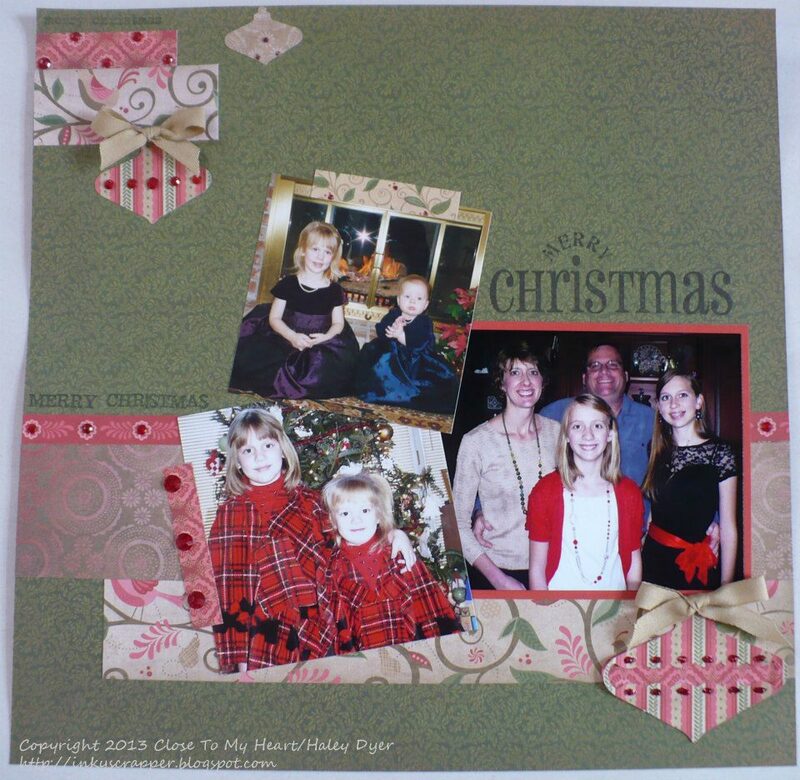 Take a look at DT Lindsey's wonderful layout. Even though this sketch challenged her, she did a fantastic job! I love how she mixed the alphas in her title but keep them the same color. Great job Lindsey! "McKenna's CYO basketball -- I just love sketches, but sketches with un-uniform lines challenge me! Rochelle's sketch actually worked perfectly with some action shots I got at McKenna's basketball. I also started another page exactly opposite this page with the leftovers for the pictures we'll take on Wednesday of her last game and trophy ceremony (you can see that on my blog -http://lindseysscraps.blogspot.com/2013/03/creative-thursday-basketball.html). There's a bunch of stash on this layout - various rub-ons, some Fancy Pants felt pieces, and some old WUBE. The flower embellishment was made from tear-drops of the WUBE as well. As for the mixed alphas, I used stickers and chipboard, but I also hid some leftover "v's" in the chevron shape in the lower right." Great job using your stash Lindsey!! Hello!! 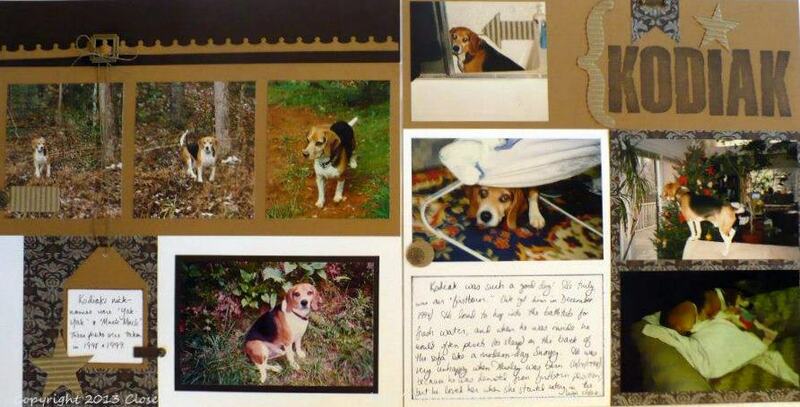 Today we have Tammy and her super cute layout! I love the colors pink and green together! Tammy did a great job on the sketch and mixing the alphas! "This was such a great sketch! 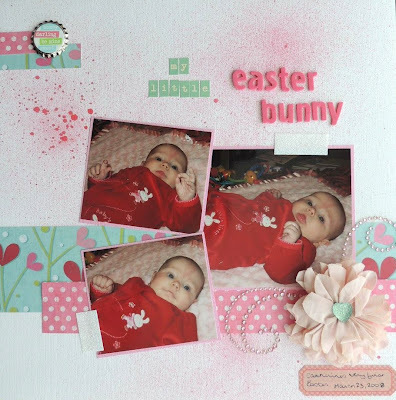 I decided to pull out some pics of my youngest daughter from 2008 and use a technique I have never used before--spritzing the base cardstock, I think it turned out pretty nice for a first attempt! Products used-- Bazzill cardstock with Heidi Swapp Color Shine spritz; WRMK patterned paper; October Afternoon mini market and American Crafts Thickers alphas; Crate Paper journaling spot; American Crafts glitter tape; misc. flower, bling, brad, and bottle cap." Check out the sketch with mixed alphas challenge HERE. "This LO has a number of photos of our first trip on the London Eye. Arthur was a bit nervous but in the end he loved it. 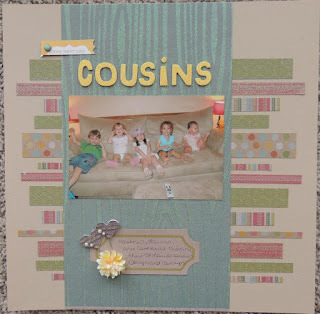 I tried to use the bright colours of the photos in the choice of paper and embellishments." Welcome to our first Sketch w/Stash Challenge!! Are you ready???? Let's go!!! 2. And because we are all about digging into our stash.... You will need to dig into your alpha stickers, thickers, etc. and create a mixed alpha title or journal. Here's some photos that my hubby and I took on New Year's eve. The Glitz paper went well with these photos that really didn't have any color in it. From my stash I pulled 3 different alphas - Yellow (year), black and red! Visit our blog daily to see how our Design Team dug deep into their stash! Sharing this fabulous layout created by Wendy C for our Kraft It Up Challenge! I hope it inspires you to dig into your stash and pull out some of your kraft and metal supplies! Wendy: ":I used kraft paper as my background, and "roughed" it up a bit with some paint daubers. For my metal embellishments, I used a metal title, pins and I found some fun fish and palm tree charms in my stash!" Click HERE for the challenge, you have until March 29th to link up and show us what you dug out of your stash! Hello and welcome to SOS!!! 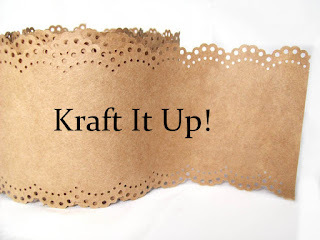 Today Tamara is sharing her take on the Kraft It Up Challenge! 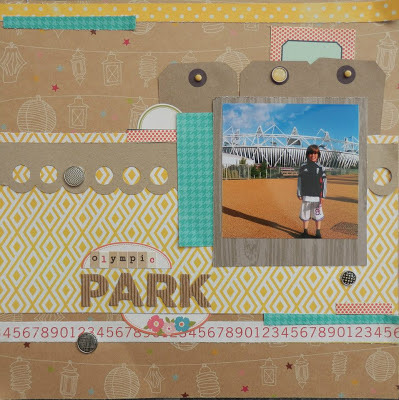 I hope you are inspired to pull out your Kraft and metal items after checking out her layout and reading about all of the things she pulled from her stash to make this lovely layout!!! Tamara: "I love the look of Kraft. I added some Kraft torn pattern paper. I roughed up the edges of the photo mat of my DS and his family. I used a Kraft sack to hide my journaling, decorated with bakers twine and a butterfly as well as the calendar piece. I also added some red accents to match the photo, and then inked up everything. I used lots of metal from Making Memories~ the word family, the ribbon slide, a clip, a heart and a flower square. This about sums it up." We hope that you will dig into your stash and pull out some of your Kraft and metal supplies and Kraft It Up with us!!! 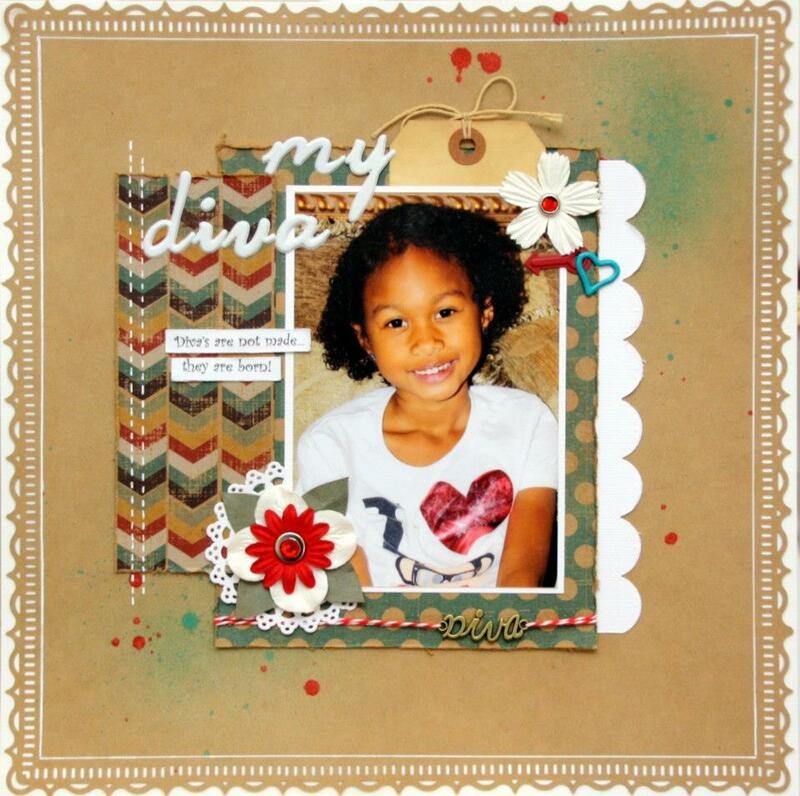 Today DT Charlotta is sharing a beautiful layout she created inspired by our Kraft It Up Challenge. 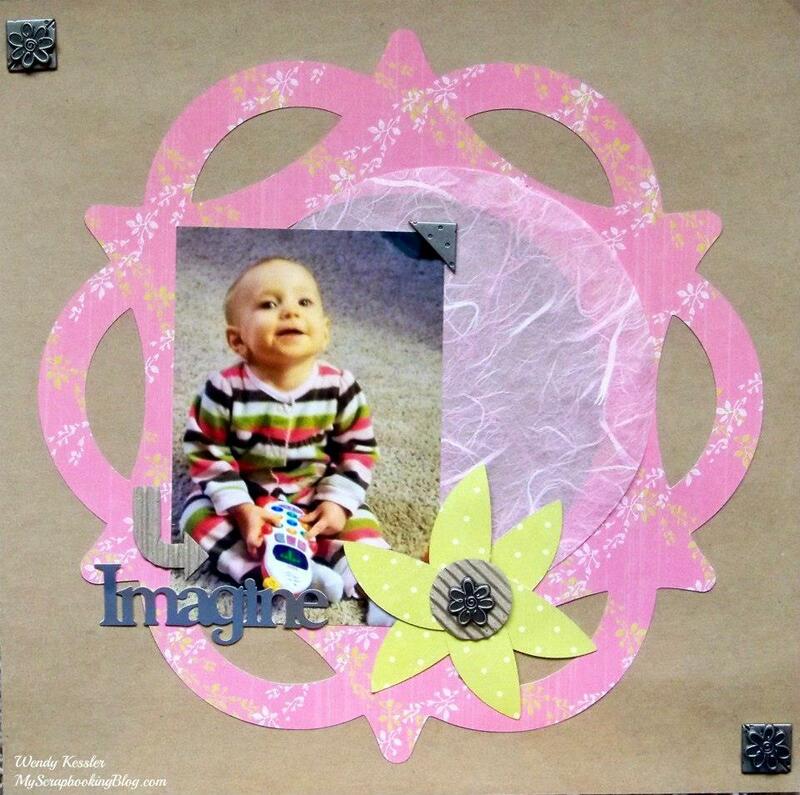 I hope it sparks some creative inspiration and gets you to dig into your kraft and metal supplies to create a layout. 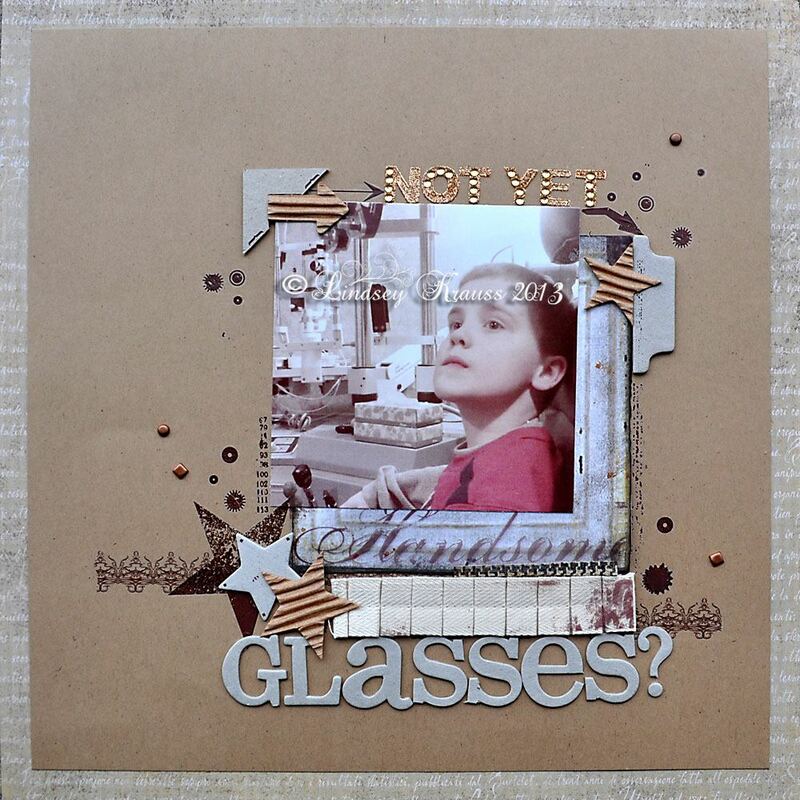 Charlotta: "I used a new stencil and Dylusions to create a pattern on my Kraft paper background. Then there are small metal frogs I found in Finland and faux metal corners from Holland. The buttons are from England, me and the pictures are from Sweden." 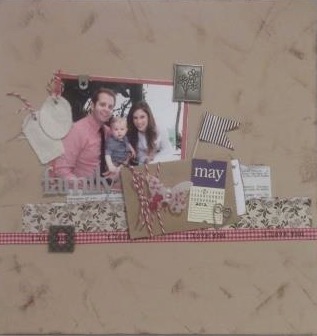 We would love for you to join us this month and see how you use your kraft paper and metal supplies! It's Friday and I hope you are ready to enjoy a wonderful weekend! Today Sarah is sharing her take on this month's Kraft It Up Challenge. Check out how she scrapped her awesome steampunk photos using kraft and metal! Sarah: "Someone said metal... my brain went Steampunk, as always! Time to scrap that stash of photos I keep trying to work through. These pictures were taken when we volunteered to help out Steampunk Ottawa at our local museum's Victorian Holidays event. Background paper (Simple Stories) is kraft-y colored though not actual Kraft paper. The foreground paper is printed Kraft paper. Flower were punched from a paper bag then spritzed with Red Glimmer Mist, another lil spritz of Green under the family photo. Metal in the title-work, sprinkle of gears here and there as well as the rows of alternating red and green mini brads. ...and Yes, I poked myself a few times doing that many! lol"
Time for you to get 'Krafty!' Click HERE to check out our challenge. We would love to see what you do with your 'Krafty' and metal supplies! 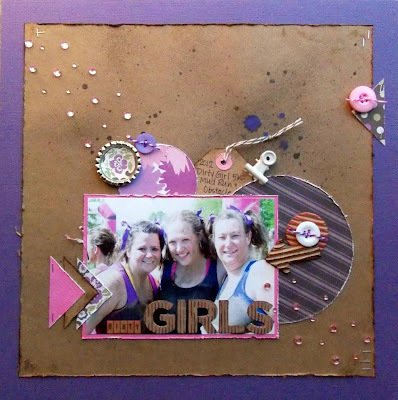 Today DT Lindsey is sharing a layout she created inspired our Kraft It Up Challenge! 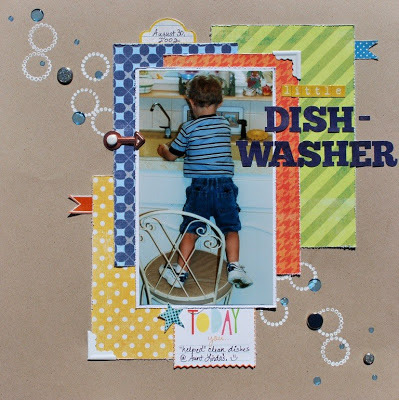 Lindsey's take on this challenge is sure to inspire you to dig into your Kraft and metal stash! Lindsey: "Kraft is more of a color thing to me. So when challenged to go kraft, I went all out. I searched high and low for "raw" things in the scraproom - from colored paper to chipboard. Instead of treating and retreating, I left everything raw - didn't even bring out the inkpad, that's transparency and rub-ons! - and it took every inch of my willpower not to add a few touches of color! The metal and rhinestones were a nice substitute for color - a little shiny never hurt anyone!" You can find the details on of Kraft It Up Challenge HERE. 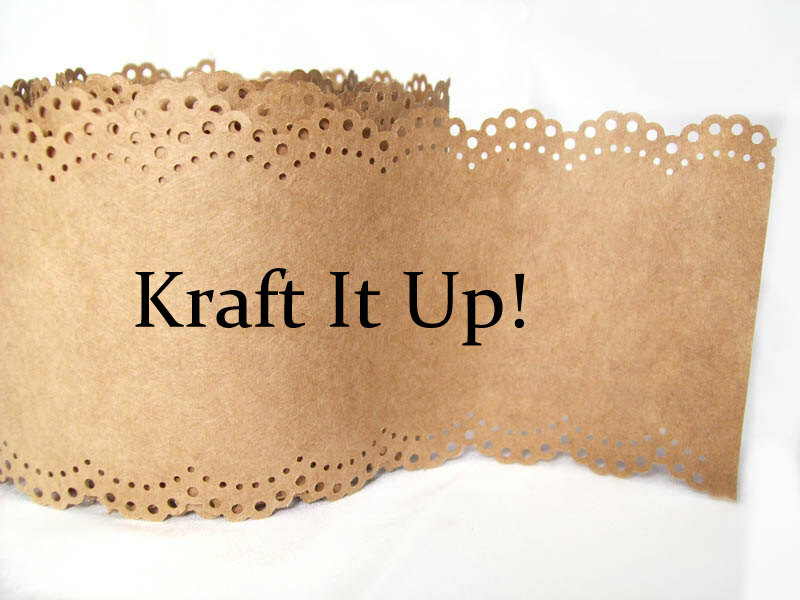 You have until March 29th to get your Kraft and metal out and show us how you get Krafty! Thanks for stopping by...stop in again tomorrow for another DT reveal!!!! Today we are sharing a layout created by our DT Michelle using Kraft paper to showcase these super cute photos of her daughter. 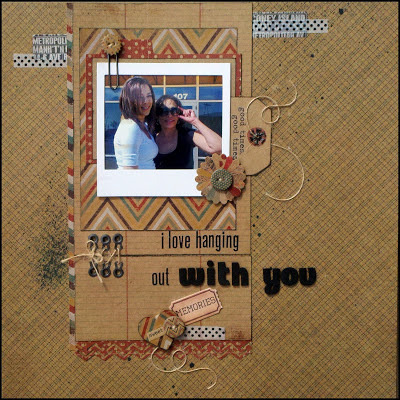 Michelle: "For my layout, I used Kraft strips, tags, handmade flags and crimpled strips. I used my diecutting machine to create my title work using kraft paper. 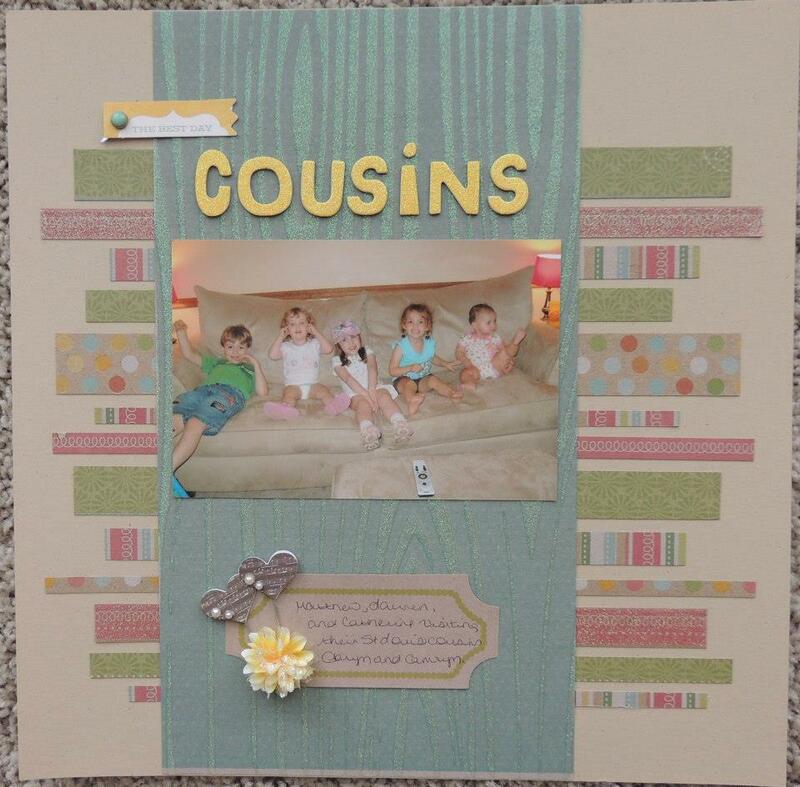 Metal embellishments used: brads, stick pins and metal photo tabs." What's in your Kraft and metal stash? Pull it out, get it scrapped, and upload it to our Kraft It Up Challenge by March 29th for a chance to win our monthly prize package! Click HERE for details!!! DT Tammy has created a layout inspired by our Kraft It Up Challenge to share with you today! Tammy: "I used to use Kraft a lot, but haven't in a long time. Of course that doesn't keep me from having a large stash of it! This is a photo of my kids with two of their cousins. 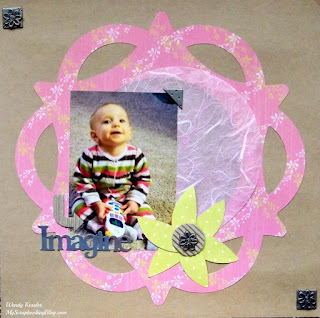 In the layout I used: DCWV Playtime stack, The Paper Company Kraft CS, American Crafts Thickers, MME brad and pennant, Jillibean Soup Sugar Picks, Fancy Pants Kraft Kuts journaling spot, and a yellow flower. I was inspired by an Allison Davis sketch for my layout. Time to dig into your stash and get your Kraft On! You have until March 29th to get your entry linked up! We would love to have you join us for this challenge! Check back each day for more DT inspiration for our Kraft It Up Challenge! What a great way to use Kraft on a layout! 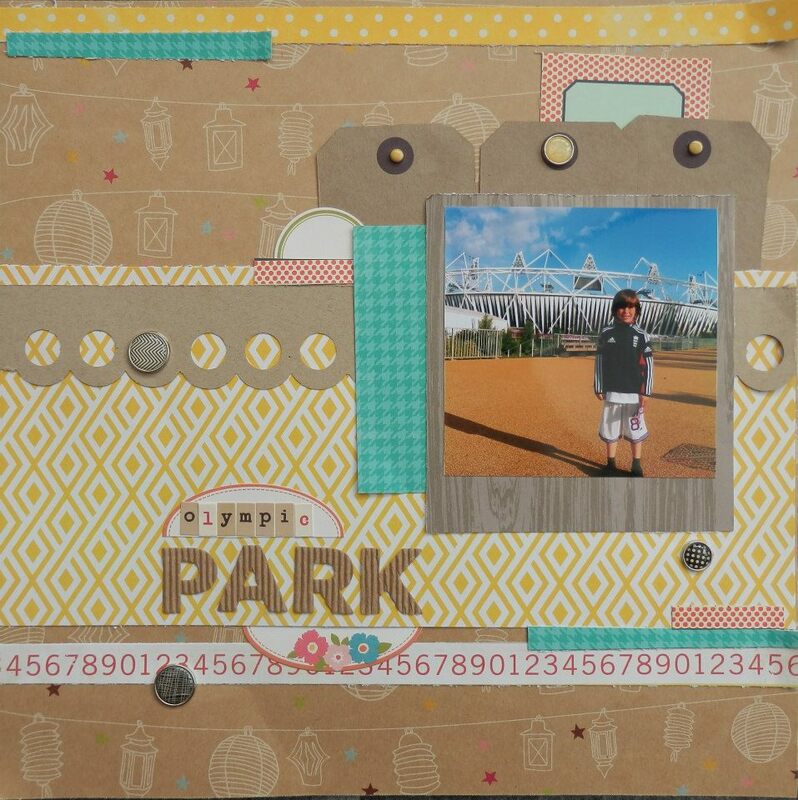 For our "Kraft It Up" Challenge our DT Karen has created this awesome layout of her son standing in front of the Olympic Stadium, using Kraft patterned paper for the background, three kraft tags, corrugated kraft alphas, and a punched border out of kraft cardstock! For the metal requirement of the challenge she used six metal brads! What kraft and metal items do you have in your stash? We would love to have you join us in our challenge this month. Our DT Kelly has created a super cute layout to share with us today! I am sure it will inspire you to get creative! Kelly: " Kraft paper was perfect for the background of my youngest "helping" with the dishes at his Aunt Linda's. 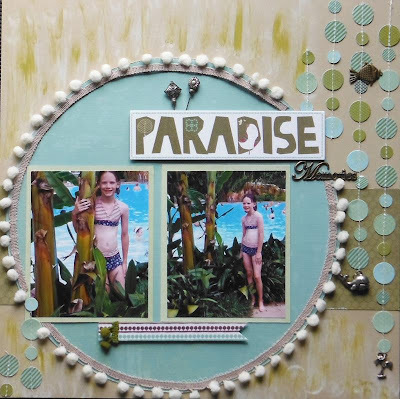 I found a circle stamp by Cloud 9 Designs and some white paint for bubbles & Kaiser blue Droplets, then found some metal photo corners, metal circle brads for more bubbles and a metal arrow." 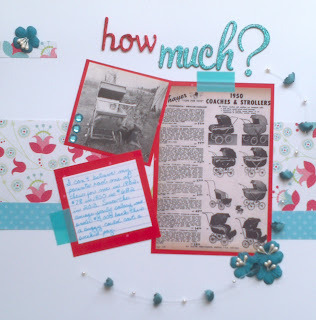 Your turn to pull out the kraft and metal goodies from your stash and create a layout to share with us! For the details on the challenge click HERE!!! Heather: "What better paper to use for a mud obstacle course (Dirty Girl) picture then kraft paper! Of course, I had to add some distressing and ink, but I love how it turned out! The metal embellishments that I used are staples, the white clip and the pop tab." Make sure you stop by daily to check out the projects our Design Team has created inspired by the Kraft it Up Challenge. We would love to see how you Kraft It Up...check out the details of the challenge HERE! 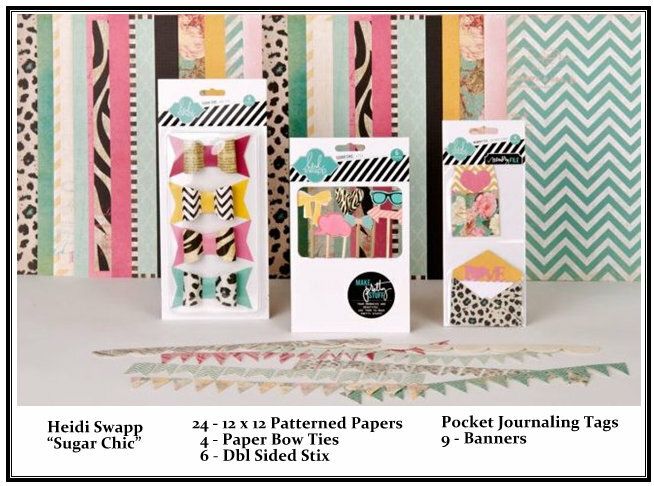 Create a LAYOUT and at least 50% of the products you use on your layout must be Kraft paper and/or embellies. Oh, and that's not it! you must include 3+ metal embellishments.. You can mix or match the metal embellishments as long as there are 3 or more on you layout. One last thing...the SOS Challenge GUIDELINES! Thanks to everyone who participated in our Giveaway A Day Event!!! We appreciate all the comments, and those of you who shared our giveaway on your blogs and/or facebook pages. My favorite challenges are any that include measurements. Lol. I am horrible with measurements! 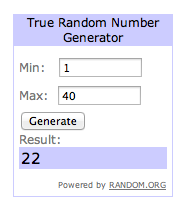 Giveaway Day 4 winner in the subject line. You have until March 15th to claim your prize. Visit our blog tomorrow to check out DT Heather's reveal and see how she "Got Krafty!"